Hell Yeah! 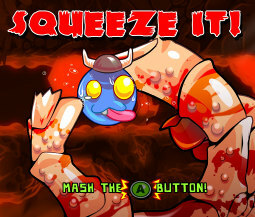 is a bloody, grotesque platformer, with an animalish avatar licensed by Sega. Kind makes me wonder if this was the result of a run in by Sonic Team and the group that created the gore-fest known as Madworld. You play as the Prince of Hell, who just so happens to be a bunny of some kind. Of course death has left you with a skeletal thin complexion; but you still have some mortal flaws, such as a fetish for rubber duckies. The story begins when someone catches you enjoying a bath rendezvous with your floating toy and posts the act onto Hell's intranet. As the Prince of Hell, of course, you're not just going to sit and take it and makes posts on your LiveJournal about all the unfair drama. Instead, you go on a mission to kill all those who laid eyes upon it. This type of humor sticks through the game, making it more for grown-up kids then actual kids. The opening cut-scene is thankfully short, oddly voiced in some kind of Sim-like garble, after which the game drops you right into the platforming. Of course it starts with a tutorial type stage and are introduced to one of your servants Nestor, an octopus with a monocle who tells you useful things about the game acting as a guide. Thankfully though he does what he needs to do and then leaves you alone to explore on your own. As I continued through the first stage I started to get a sense of its structure. There are metal doors that block your advancement and to get through you'll have to defeat large monsters scattered throughout the level. They are unique, activate mini-games which when succeeded will deliver the killing blow, and spatter a profuse amount of blood so they are easy to determine from the normal enemies. Oh, that and a radar helps point the way to their location. As the Prince notes, they may not help you locate seven emeralds -- wait, did Sega just make fun of the fact that the Chaos Emeralds in Sonic the Hedgehog are a reference to Dragon Balls? Couldn't be, 'cause then the level would have frozen over. Oh, but making fun of itself isn't as far as it goes, you'll find many little references from all over the gaming spectrum, particularly in the mini-games. The references range from anywhere from Space Invaders, to Zelda, to Mortal Combat. Early on, you'll get a buzz-saw which you'll use throughout the game, similar to how Sonic does his spindash to break though terrain and kill monsters. As a feature, of course, each use will be signalled by the bunny making an entirely necessary vroom noise, because you can't saw into your enemies without appropriate onomatopoeia. You get other weapons later on to use at a distance, such as a rocket launcher. You know, in case a giant saw wasn't a subtle enough way to dispatch your opponents. Despite this, there is some back and forth in the game. You spend some levels more vulnerable and out of your buzzsaw and no weapon. You'll be using the environment in order to try to defeat your opponents, which makes a nice break in the style, keeping it from being just a mindless slaughter-fest. The animations are very smooth and the game flowed quite well. Even when using the keyboard instead of the preferred gamepad the actions were not stiff or hindered. If it wasn't for some of the finishing blows in the mini-games requiring the mouse wheel, you could even have done it without a regular mouse. The environments are surprisingly varied for taking place in Hell. The first level is the only one that's overly red and full of fire. Other locations include laboratories, a heaven-like casino area, and even space. My first main concern was going to be the difficulty; the first level was pretty easy. However, it does pick up a bit when the game introduces enemies that can't be hurt by certain attacks and some more dangerous platforming. Luckily, the game auto-saves with checkpoints so you don't have to worry about getting too let down by your failures in pausing the action. However, there is an issue with this checkpoint feature: when you die, you don't get full health back at the checkpoint but instead start with that amount of health you reached it with. If you are one hit away from death when you cross a point, you'll start with one hit upon death from that spot. While this certainly made the game challenging, in later parts where healing spots became more scarce it felt unnecessarily punishing. The way to counter this is to use the monsters you kill as your personal servants to harvest items. You'll probably want to put them mostly to food when you get the chance. This way when you find yourself dying a lot you can go back to the main menu and send yourself some on-the-spot health. Of course, this can break the flow of the game, as the gifts your monsters harvest isn't based on in-game time, but apparently on real-life time. So if you find yourself getting stuck you'll have to stop and come back to it when you get some health harvested. The biggest flaw of the game is that there are some enemies that seem impossible to kill and I spent hours messing around before simply zooming which caused them to inexplicably die. I was reminded of the barrel in Sonic 3. The gulf of execution for killing these monster was too distant and caused needless headache and backtracking. I eventually did it without looking it up, but I did button-mash. A puzzle is supposed to be clever, and provide reward. Not cause needless frustration and hinder progress. Overall, you'll find a well-made game that's solid in its gameplay, keeps things relatively fresh, and provides a decent challenge. It ends at about the right time, as it seems they were running out of ways to dispatch foes, and the finishers started to repeat with more frequency. The end boss was pretty easy, and the ending itself is pretty lacklustre. However, if you love platforming with a side of violence, Hell Yeah! is certainly a game to consider picking up – at least if you like a platformer that's not quite as bare-bones as its rabbit protagonist.